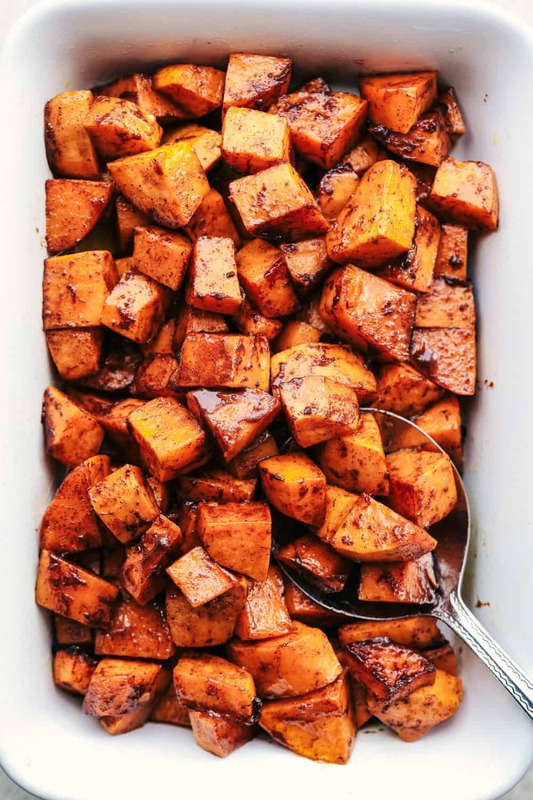 Roasted Honey Cinnamon Butter Sweet Potatoes get roasted with the incredible flavor of cinnamon honey butter to create the absolute perfect side dish! I always get so excited for Thanksgiving. I especially love that we can have Thanksgiving at our new house and it can host the entire family. It makes it a whole lot easier preparing everything now that I have double ovens. I can be cooking the turkey and all of the delicious side dishes that I want to include. I am always trying to find new and different side dishes to include. And really, the side dishes end up being the star of the dinner table. This year I decided to roast the sweet potatoes in the most amazing honey cinnamon butter glaze. And boy did these turn out delicious! I love sweet potatoes with cinnamon butter so I thought why not roast them with a honey cinnamon butter? One of my favorite ways to make vegetables is by roasting them. They get the slightly crisp edge and the tender center. 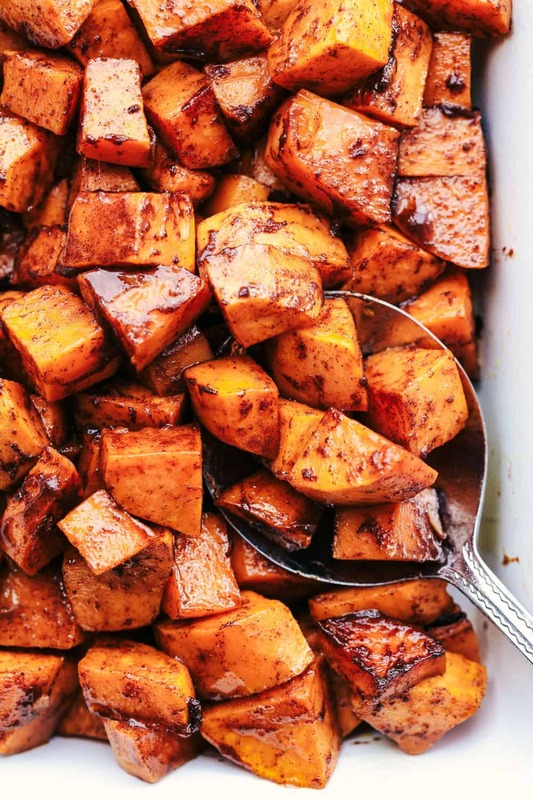 Now imagine roasted sweet potatoes in a honey cinnamon butter glaze. Holy delicious! How do I roast sweet potatoes? Toss the sweet potatoes in the melted honey cinnamon butter mixture. Pour to make an even layer on a baking sheet. Bake in a preheated 375 degree oven for 25-30 minutes stirring once in between. These sweet potatoes are so easy to make and an incredibly delicious side dish. 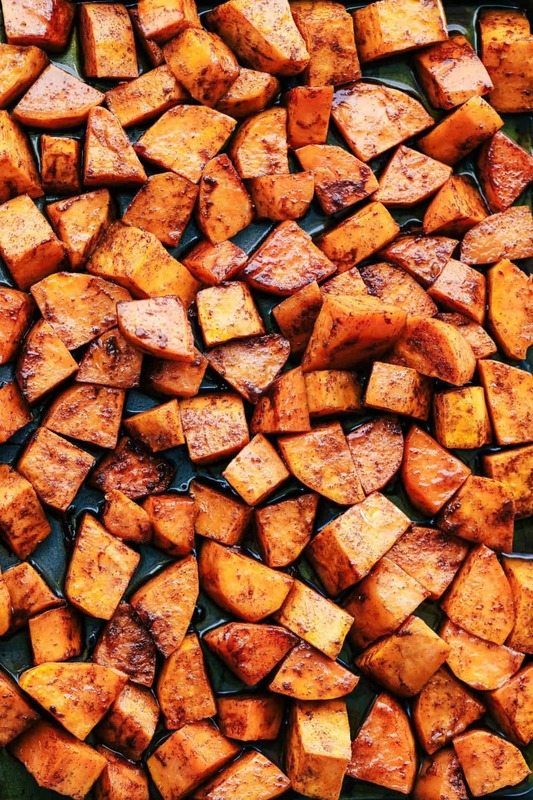 Just imagine a roasted sweet potato with a honey butter cinnamon drizzle. You may have just created one of the best side dishes at the dinner table! You are going to love them just as much as our family did! Preheat oven to 425 degrees. 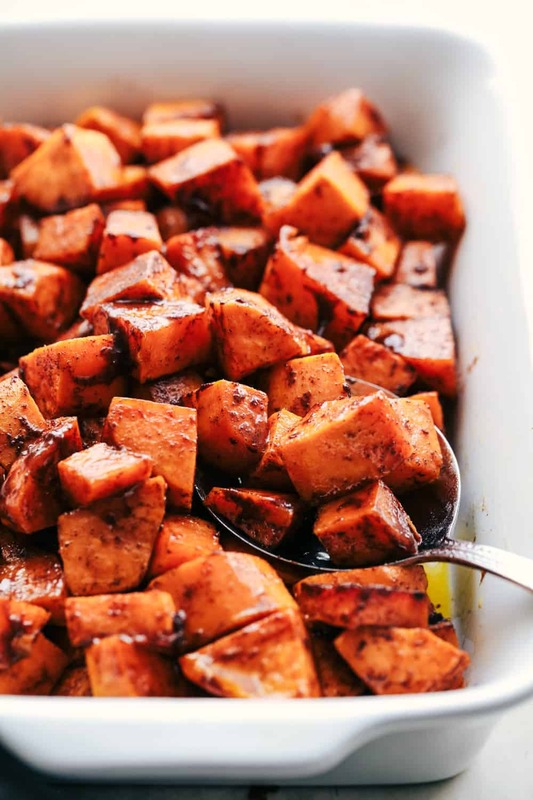 In a large bowl add the sweet potatoes, butter, honey and cinnamon and toss to coat. Spread the sweet potatoes into a single layer on a baking sheet. Bake for 30-35 minutes stirring halfway though. Toss the sweet potatoes in the sauce at the bottom of the pan and serve. Thanks for all these awesome recipes, I’ve enjoyed them and thoroughly enjoy your Critic page!! In your description it said bake at 375 for 25-30 mins and on the recipe it said 400 for 30-35 mins. Which should I do? Thanks for the recipe. It looks great and I am alway looking for a new way to cook sweet potatoes. I have a question on the degree for the oven and the cook time. Which is correct?